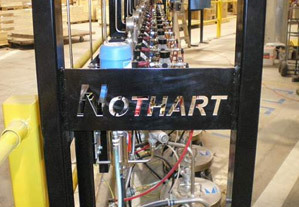 ﻿ What We Do | Nothart Engineered Sales Ltd.
Nothart Engineered Sales Ltd. is a Customer focused Manufacturers Sales Agent/Rep for Municipal, Industrial, Manufacturing and Institutional process equipment. What this means in English is that we size, spec, and sell ... Boilers, Blowers, Pumps, Finishing Equipment, Fans, Mixers, Valves, Nozzles, Gauges, Controls, and electric motors . We work with Consulting Engineers, Mechanical Contractors, Plant Engineers, Maintenance Planners, Production Managers, and many other folks who keep our society going day to day. We are involved in all types of process, which include, and are not limited to, Lift Stations for sewer systems, Vacuum Pumps for food processing, Paint Lines for automated kitchen cabinet or farm tractor manufacturing, Mixer applications for the Mining industry Etc. We like to say that if it goes up and down or round and round ... we're all over it. We generally start a file, either from a repeat customer, a referral, or a solicited request for business. Once we have an understanding of the issue at hand and the pertinent data has been collected, we review our product line for the suitable solution, and provide a quote. From that point on ... when we receive the PO we get the solution on the go. Once the customer has the specified piece of equipment in place, we can be counted on to stock required maintenance / wear parts, and or oil. In the event that Service is required, we have a ready and able Tech staff on hand to provide start ups, repairs, or service advice. So, to sum up, Nothart provides proper sizing, top of the line equipment, stocks parts for equipment we have in place at end users, has a focused service department, and above all, we strive to keep your business, by earning it.